I saw the above photos from my Facebook groups which was first shared from Journey To Your Financial Independence, I do not know the owner of the photo so I just credit it to the page. Anyway, I got a good idea from this simple flow chart, and if all people will just realize the power of the above mentioned flow chart, people will be able to gain financial freedom. I think the hardest part of the diagram is the “reduce expenses part”, especially if most of the expenses are fixed and cannot be adjusted. 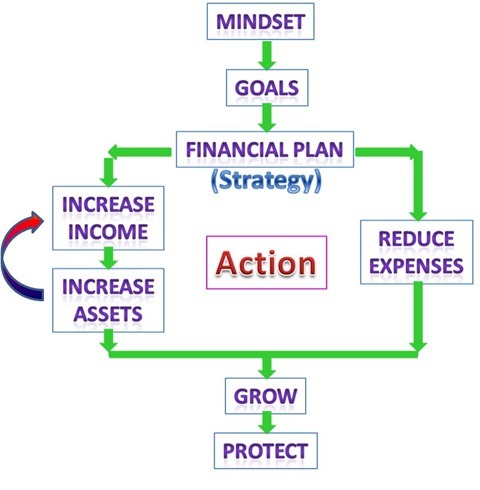 What I love are the steps on the left which is to increase the assets that gain income. As a person who wants to be financially free, increasing an asset that gives income is a way to have a debt free lifestyle. For me, I would choose having an asset that could give me a passive income. Mindset, Goals and Financial Planare very important since without it, a person would not be able to move from his present situation. For me, I am not in the position where I can reduce my expenses, because most of my expenses are fixed like school, foods, lot mortgage, family assistance and more. What I am doing is to increase my income through blogging, professional fee, online and offline businesses and more. If only somebody have teach me about personal finance, then probably I have invested a portion of my salary long time ago. But I believe it is better late than never. Now, I am spending time reading books, watching personal finance videos, reading blogs, joining Facebook groups to educate me and my family about investment and personal finance. By the way sooner or later, this blog, which will someday become and asset, will also be part of my additional income that could generate money from advertisers. It is important to increase assets that could produce additional income. Just a piece of advise, pray and ask God to grow and protect your investment and avoid procrastination. Welcome sir, Thank you also for visiting my blog. That place is my shout out once I did something new or accomplished a project on my are of interest. Thank you in advance sir, your site is very helpful especially in us that are still wandering about investing the money that we earned. More power and blessings to come. GOD Bless you and your family. Thanks and God Bless You too. 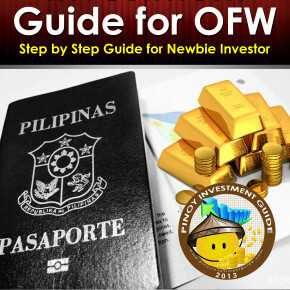 It is good to know that like me, you are also an OFW and have faith in God. I aim to educate our fellow Filipino in order to be enlighten that we need to start investing and be informed about Financial Literacy. Yeah! That’s what I’m trying to do as well. Saving is the first step to success, but it isn’t even half the battle.